This is a sweet little card – perfect for a birth announcement, recognition or first birthday. Start with Piccolo Card Decor Set #8. Carefully remove the two pieces from the frame and clean up any rough edges by lightly sanding. I find it rare that I need to sand any edges on the Piccolo elements; they tend to remove easily and cleanly from the background. Start by inking your first piece with Piccolo Enamel Adhesive and sprinkle on the Piccolo Enamel. I like to tip my covered element over a bead or glitter tray to catch excess enamel rather than tap it off. Heat set the enamel with a heat tool. I used two coats of Piccolo Detail White on the flourish and heart elements. The larger element is enameled with Poodle Skirt Piccolo Enamel Powder. I set two coats and randomly sprinkled some areas with a third coat and heat it just enough to set but not melt completely. We call this the Flash Heat technique. It gives the piece a bit of a rough appearance and creates texture and dimension. I then inserted the flourish and heart back into the background element to create a two-tone effect. Love the way it looks – the smooth white against the rough pink. I made my card from cardstock cut to size at 5 1/2 inches-by-8 1/2 inches, then scored and folded it in half. Then cut a piece of pink cardstock to 4 1/8 inches-by-5 3/8 inches, and processed it through the Xyron 5″ Creative Station using permanent adhesive. I like to leave the protective backing on until I’m ready to adhere it to the card so I stretched the green May Arts ribbon across the center and wrapped the ends to the back, gently peeled the backing just enough to adhere the ribbon. I used a ChipToppers sticker from Bazzill Basics Baby Girl sticker sheet and mounted it a scrap of green cardstock then trimmed it leaving about 1/8 inch frame around the sticker. Between the amount of Piccolo pieces on Card Decor Set #8 and the numerous stickers on the Baby Girl sheet I could easily get 4-6 cards. That’s extremely economical and I’m all about economical these days! I adhered the Piccolo element to the pink card front, added some dimensional foam tape to the back of the sticker piece (leave the protective covering on) to elevate to match the Piccolo element. Determined placement over the Piccolo, placed both pieces on a piercing mat and used a piercing tool to pierce three holes. Inserted brads through all three parts: sticker, Piccolo and card front and flatten with a bone folder. This will allow your decorative front to lay fairly flat on the card. Next, I peel the backing from the dimensional tape on the sticker and press that down. Then remove the Xyron protective cover from the back of the pink card front. 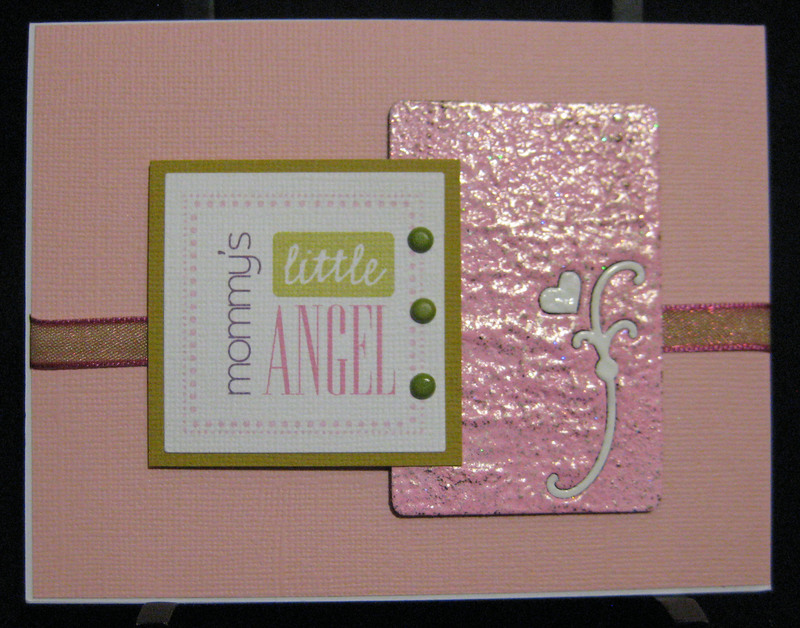 Carefully line the pink, embellished card front up to the folded card front and press in place. 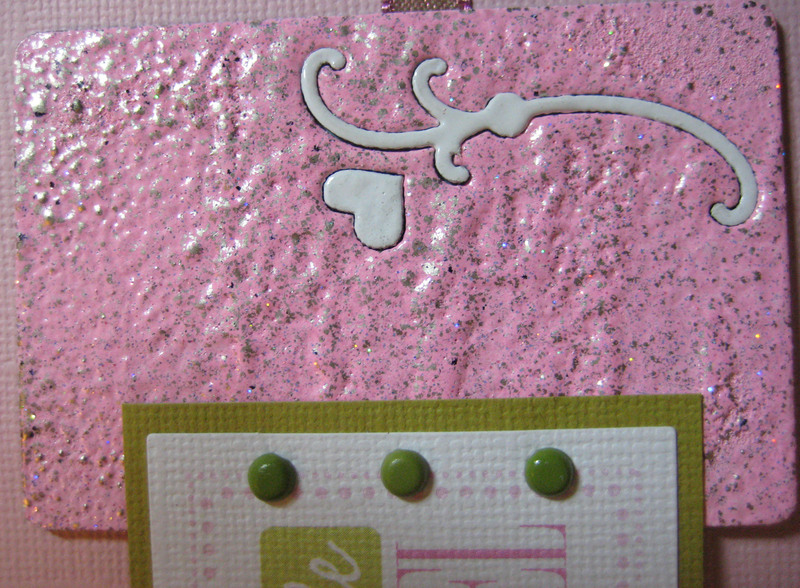 Hop on over to the Globecraft Memories blog to see another card I made from Piccolo Card Decor Sets! Want to create with these products yourself? We’ve got an awesome coupon code to share with you! Enter code JP25 at checkout on our website globecraftmemories.com to receive 25% off your entire order, no minimum or maximum! Hurry,this offer expires soon so order today! I like the look of the card. All of these products you are using are they readily available or just online? Glad you asked, Karen! I do know that Altered Art Addicts carries all the enamel powders and most of the Globecraft Frames. Scrapbooker’s Hideaway in Millington carries some; I would check first before driving out. 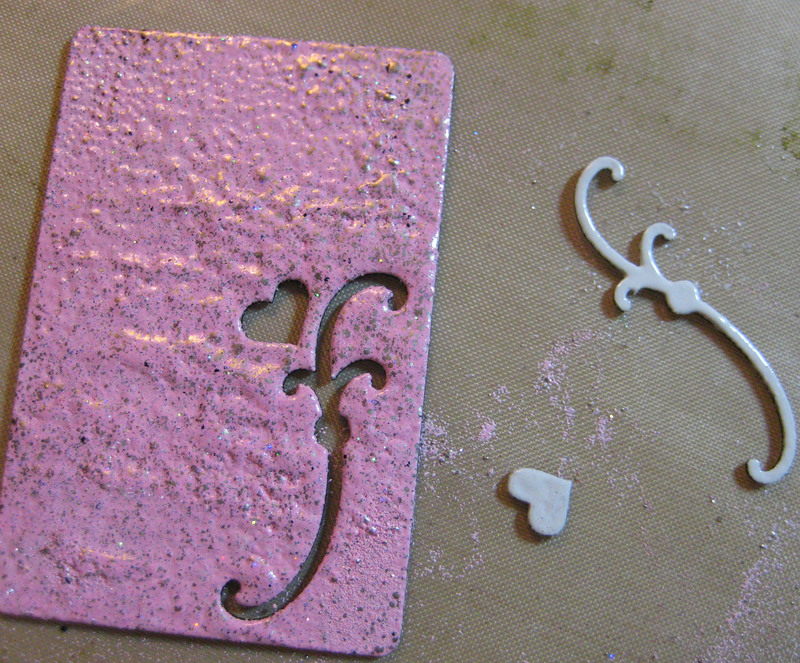 The enamel powders are wonderful – I really, really like them -even though I do not do much embossing. You can really play with these and create different textures. You are only limited by your imagination as to what you will put in these little frames – I’m really lovin’ the ornament size! How sweet! I like the flash heat technique. Thanks, Robin. This embossing enamel is so cool! I’ll bring some to club sometime and we can all play!